From time to time you might have heard me say that a book kept me up late, wanting just one more chapter. Tall Oaks was one of those books. Except in this case, I couldn’t stop at ‘just one more’. I couldn’t stop until it was done. Twenty to three on a Sunday morning. That’s what time I finished Tall Oaks. That’s how good it is. The rest of this review is merely set dressing, just go and buy it already. It’s going to be in my top ten books of the year, I can tell you that now. I’d heard chatter about Tall Oaks on twitter, mainly from Liz of Liz Loves Books. And Liz particularly loved this book, and wasn’t shy about saying so (is she ever?). I’d somehow managed to resist, citing an ever-growing, tottering TBR pile. But in a moment of lapsed attention, I found myself with a copy on my kindle. I settled in for a story of a small town and a missing child, thinking that I’d read stories like this before. 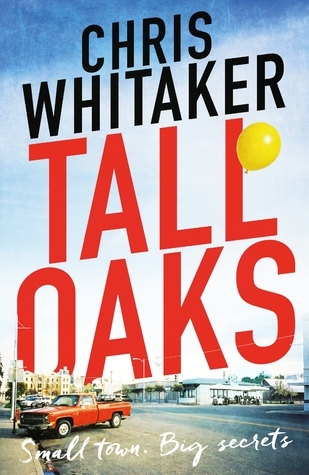 The sense of small town America seeps through the pages of this book and I was surprised to find out that Chris Whitaker is, in fact, British – born in London and living in Hertfordshire and yet has captured the feel of the town so brilliantly. What’s even more astonishing is that this is a debut novel – the writing, plotting and characterisation are confident and accomplished, and if this is just the start of Chris’s writing career, I cannot wait to see what he comes up with next. Thankfully we won’t have too long to wait, as his new novel All The Wicked Girls is out in the summer. My pre-order is already in. You can find Chris on twitter @WhittyAuthor.